1. Preheat oven to 450°. If applicable, remove neck and giblets from chicken, and reserve for another use. Rinse chicken with cold water, and drain cavity well. Pat dry with paper towels. Sprinkle 1/2 tsp. salt inside cavity. Place lemon half inside cavity. 2. Stir together pepper, rosemary, and remaining 1 tsp. salt. Brush outside of chicken with oil. Rub 2 1/2 tsp. pepper mixture into skin. Sprinkle remaining pepper mixture over both sides of breast. Place chicken, breast side up, on a lightly greased wire rack in a lightly greased shallow roasting pan. Add 3/4 cup water to pan. 3. Bake at 450° for 20 minutes. Reduce heat to 375°, and bake 30 minutes. Baste chicken with pan juices; drizzle with melted butter. 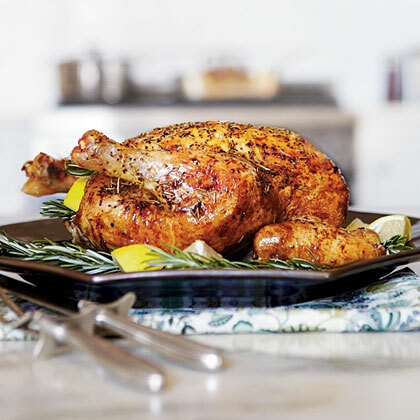 Bake 15 to 25 minutes or until a meat thermometer inserted in thigh registers 165°, shielding with aluminum foil to prevent excessive browning, if necessary. Remove chicken from oven, and baste with pan juices. Let stand 10 minutes before slicing.